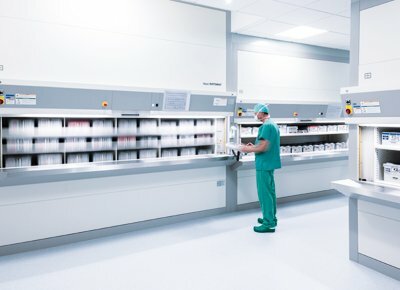 Hänel Storage Systems has created a unique solution that addresses several challenges of central sterile storage in hospitals. 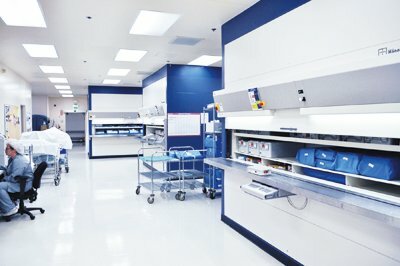 The Hänel Rotomat® has revolutionized the sterile processing department for storage of surgical instruments in the SPD and the OR and is already used in many hospitals across the United States. 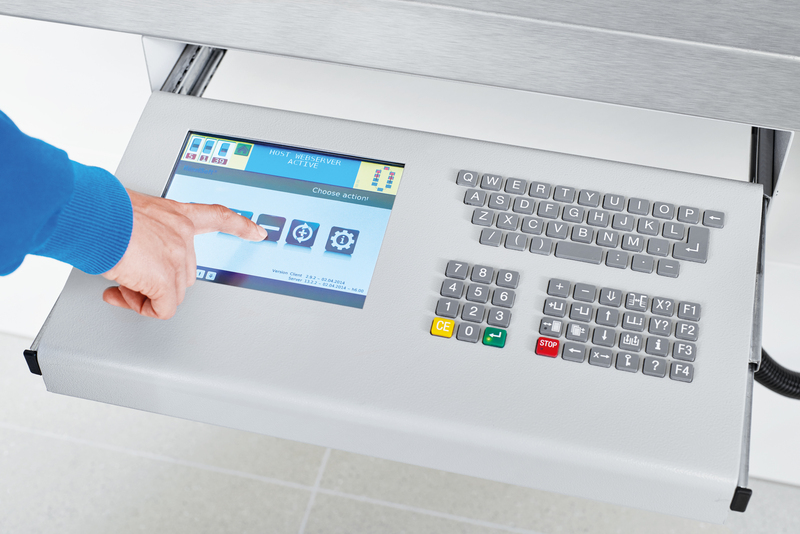 Hänel's Rotomat® automated vertical carousel system offers maximum efficiency when it comes to delivering surgical instruments and equipment in the central sterilization room of a hospital. 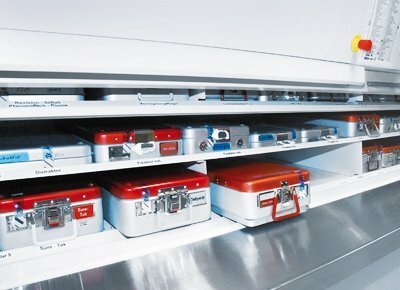 The Hänel Rotomat® system is especially suited for storing anodized aluminum containers containing sterilized surgical instruments. The system holds thousands of individual items in a clearly arranged and protected environment – the right surgical instruments are always ready for retrieval – even in emergencies! The ergonomic work counter makes retrieval very convenient. 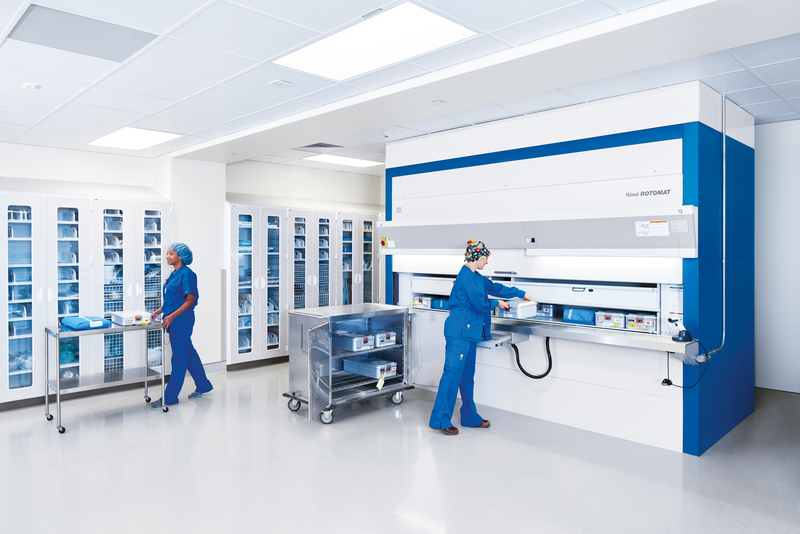 At John Muir Medical Center in Walnut Creek, CA, wire carts in the central sterile processing department (SPD) could not supply enough storage capacity to meet increasing demands, but already consumed a large amount of space. Facing a $1.2 million facility expansion, the organization avoided the cost and lost time associated with new construction by turning to Hänel. The Hänel Rotomat® in a state-of-the-art SPD. 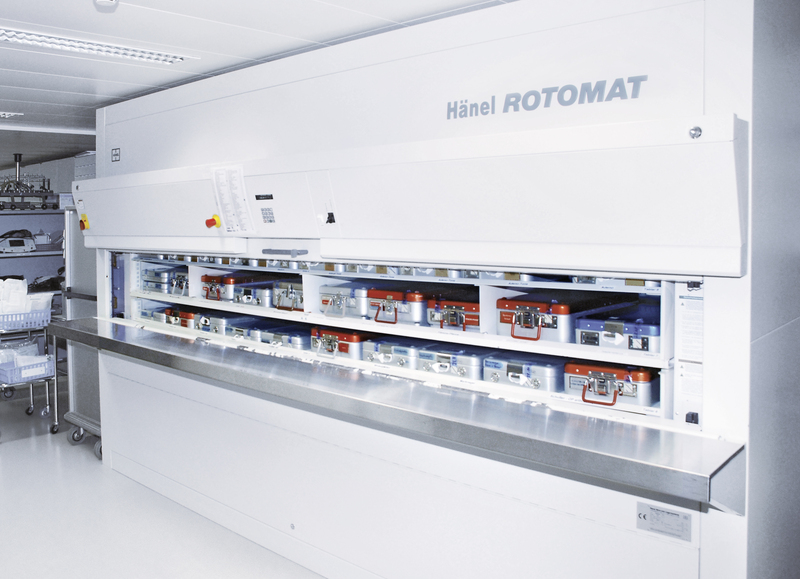 Surgical instruments and other inventory are now stored in 12 Hänel Rotomat® in a state-of-the-art SPD. Items are brought to the user, eliminating the need to search the carts spread around the SPD. Case carts are now picked quickly and accurately each time, with the push of a button. 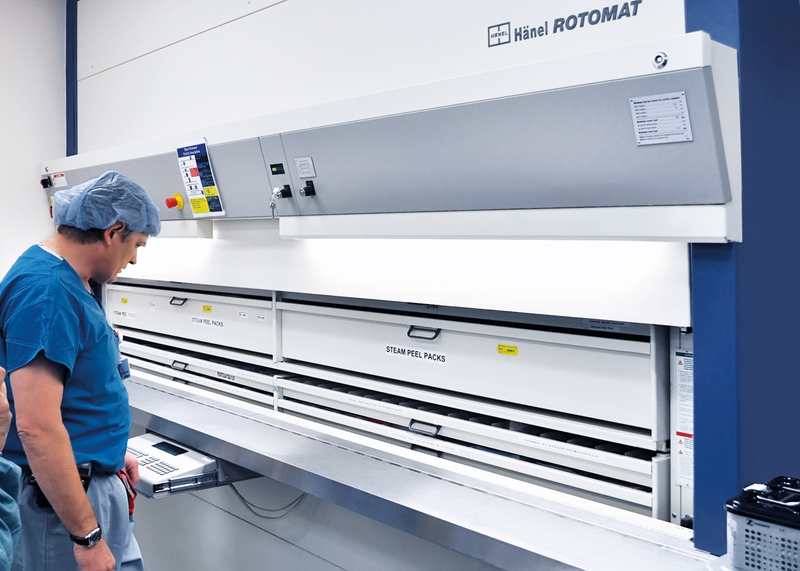 The sterile processing department was equipped with 10 new Hänel Rotomat® vertical carousels. 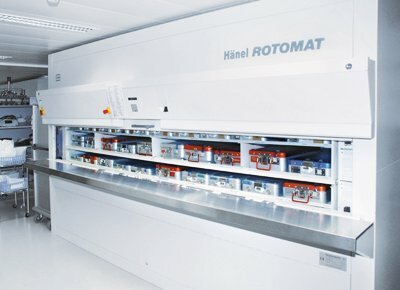 By storing vertically, the Hänel Rotomat® utilizes available room height from floor to ceiling. Items are brought to the user, eliminating the need to search the carts spread around the SPD. Case carts are now picked quickly and accurately each time, with the push of a button. 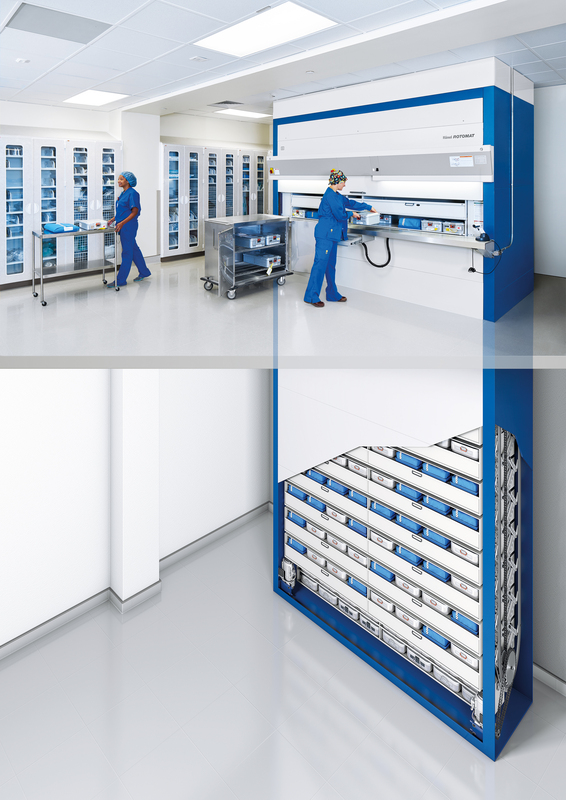 The high density storage of surgical instruments, implants, disposables and other inventory are now stored in 12 Hänel Rotomats® in a state-of-the-art SPD. The task defines the features: Hänel storage systems offer tailored interior configurations for the most diverse requirements. 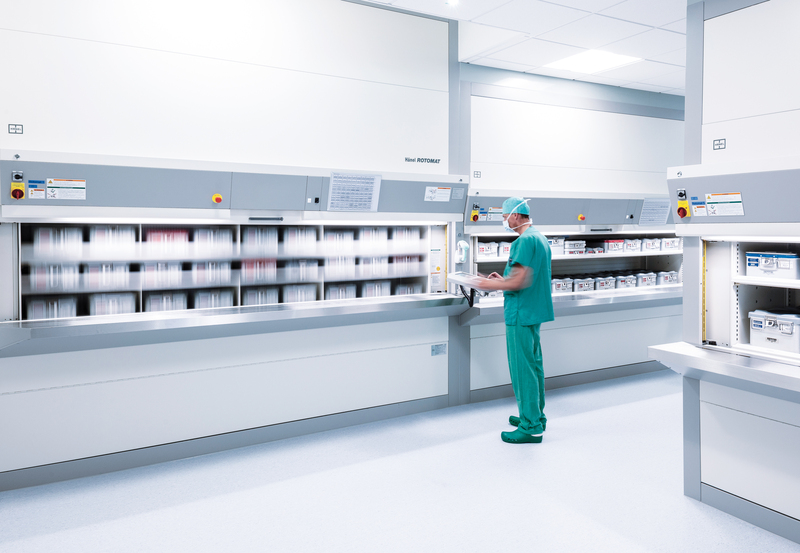 Hänel storage systems offer maximum efficiency in the retrieval of surgical instruments and equipment in the central sterilization department of a hospital. The Hänel Rotomat® holds thousands of individual items in a clearly arranged, protected environment – so the right instruments are always ready for retrieval even in emergencies! 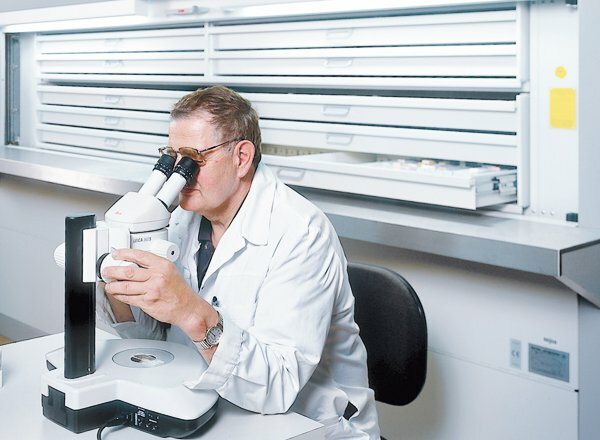 In many hospitals, pathology specimens are stored in Hänel systems where they can be quickly accessed for examinations. The retrieval of sterile containers takes place at the optimum ergonomic height. 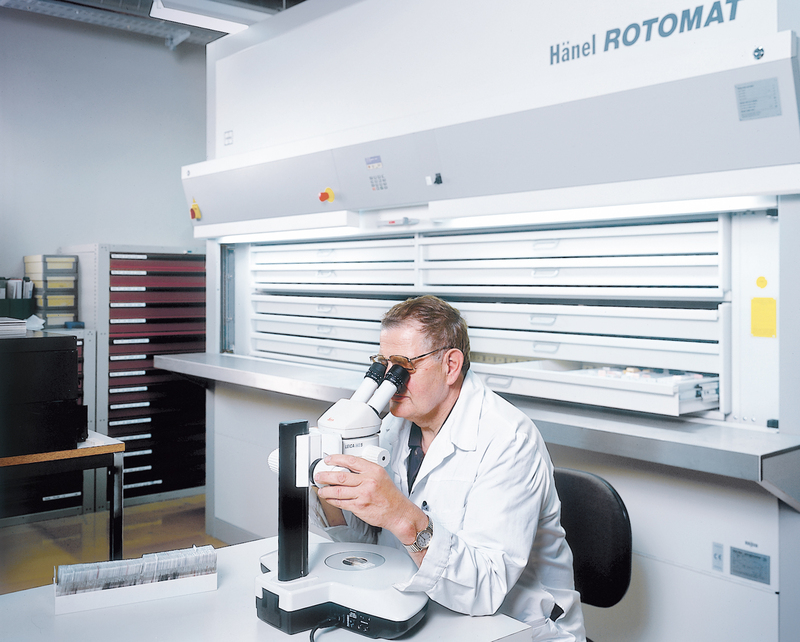 Pathology specimens are stored in the Hänel Rotomat® where they can be quickly accessed for examinations. 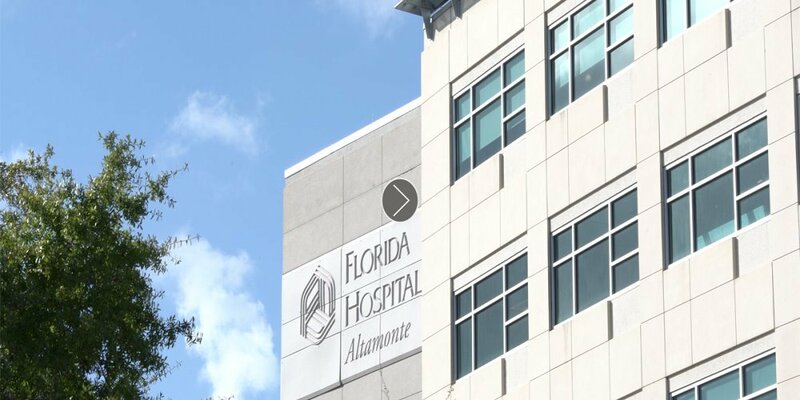 Florida Hospital Altamonte in Altamonte Springs, FL, has 2,300 employees and the very latest medical equipment, including innovative screening technologies, to provide comprehensive medical care in central Florida. 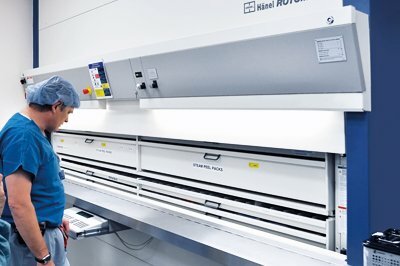 The hospital also relies on several Hänel Rotomat® systems. 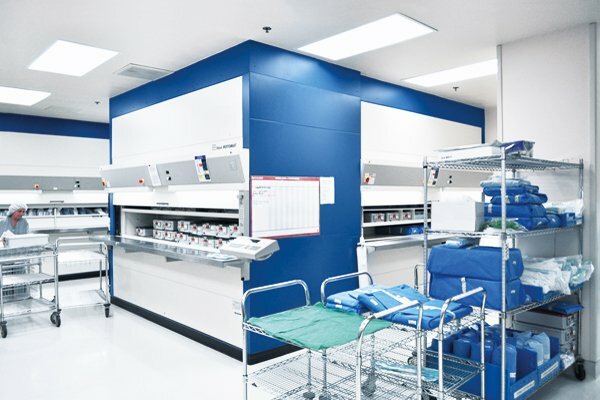 Fast provisioning of sterile operating room material on demand is guaranteed because one Rotomat® storage system is located just a few steps away from the OR area. 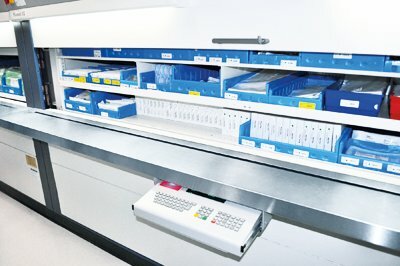 To ensure that this system would provide maximum storage volume for the sterile storage for OR/CS supplies, it was installed in a shaft having a depth of 20 ft/6 m. Since the system has a total height of 26 ft/8 m, an enormous amount of storage capacity is available within a minimum footprint. 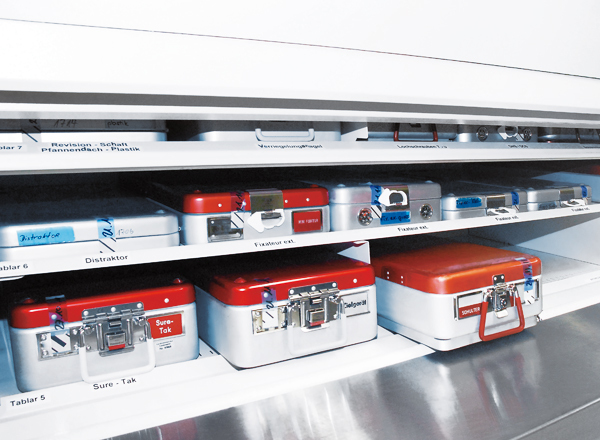 The Hänel Rotomat® is used to store surgical instruments in sterile containers to protect them from all kinds of contamination. At Florida Hospital Altamonte in Altamonte Springs one Rotomat is installed near the operating rooms in a shaft that is 20 ft/6 m deep. 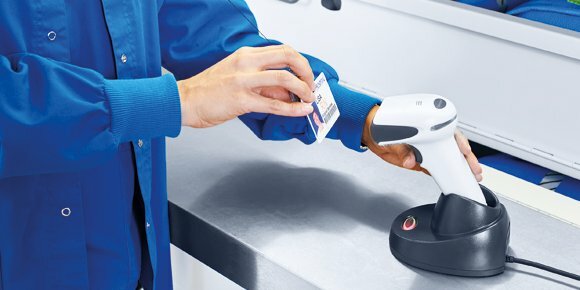 Barcode-supported access control with HänelSoft® in hospitals. HänelSoft® – ideal in hospital environments. The retrieval of these containers takes place at the optimum ergonomic height. Once logged in, employees enter the item designation using the system terminal to retrieve the sterile article they need. The overview displayed can then be used to select the correct storage position. 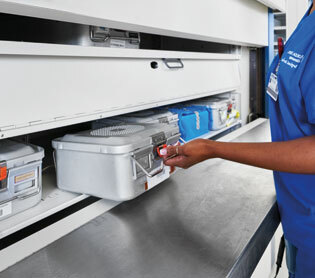 The sterile containers are transported to the access point quickly, and items can be retrieved for the OR without any chance of errors. All of the lift systems are controlled via HänelSoft® which makes put and pick operations, as well as sterile storage and inventory management, much easier. 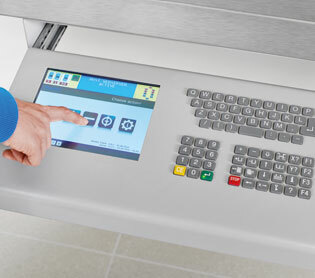 The storage positions and items on inventory are identified with HänelSoft® and then displayed on the lift control terminal. 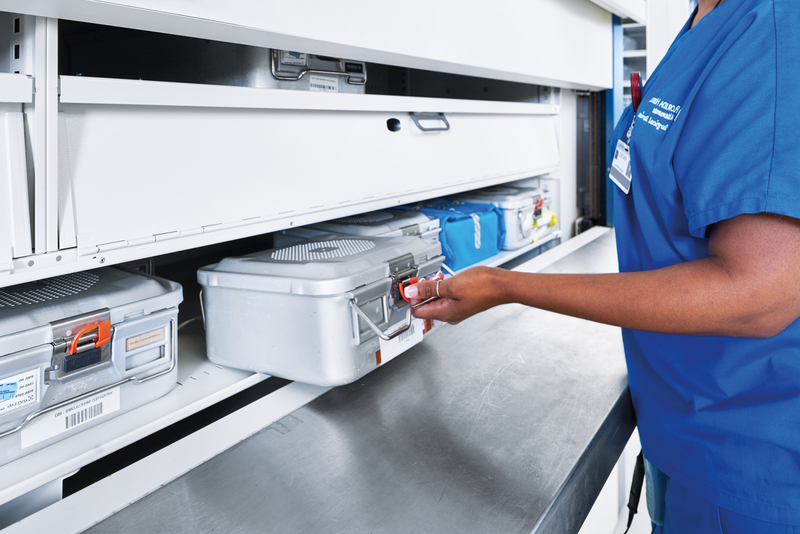 The Hänel Rotomat® system is especially suited for storing heavy anodized aluminum containers storing sterilized surgical instruments. Items weighing up to 10 kg/22 lbs glide effortlessly to the retrieval point. Furthermore, the carousel principle of the system ensures efficient, ergonomic, safe and error-free item retrieval. In the past, boxes were stored on immovable shelves or racks at different heights. Now there is no walking, bending, stretching or ladder climbing. 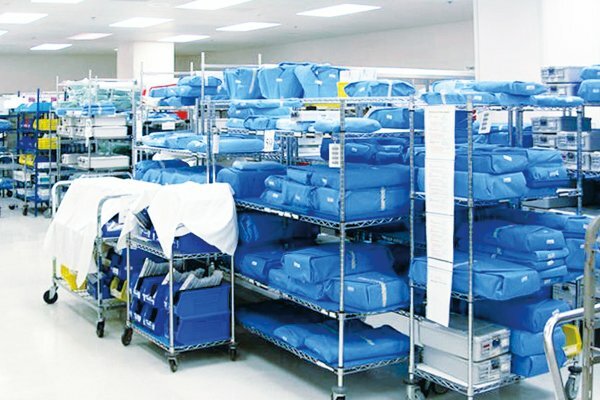 In the sterile storage area shown, basic surgical instruments and material needed for the operating rooms are stored in sterile containers and in standard DIN-sized containers. 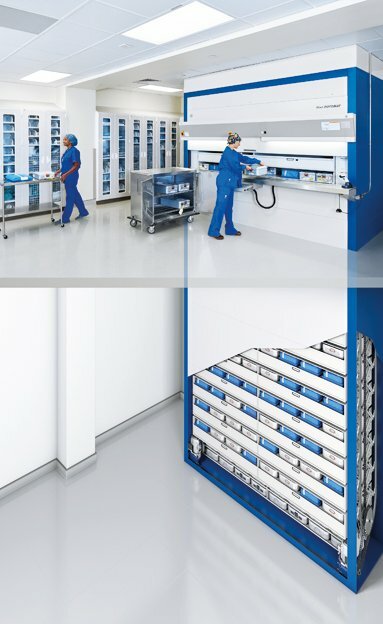 Hänel storage systems can save up to 80% of existing floor space. 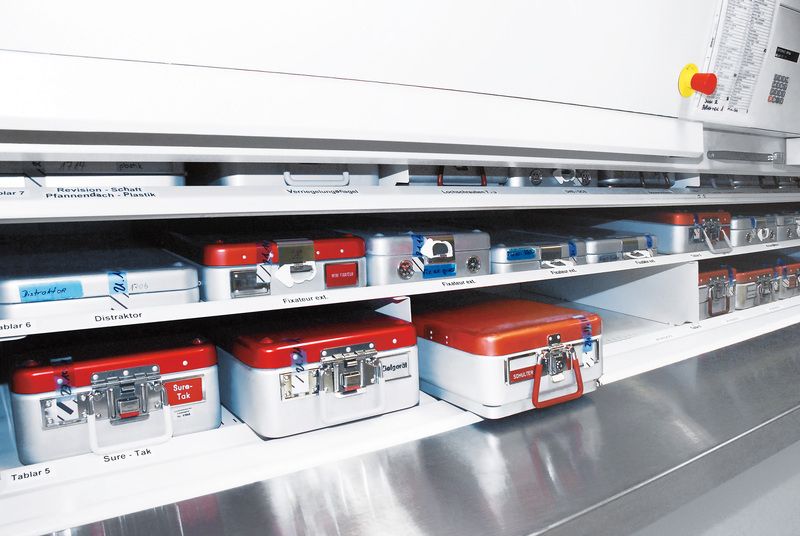 Protected storage of surgical instruments in the Hänel Rotomat®. 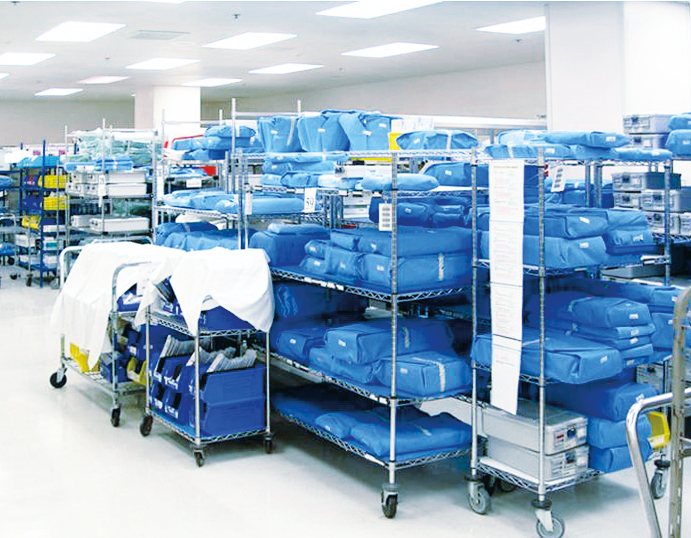 Organized surgical instrument storage in the sterile processing department of a hospital is critical to managing the ever-increasing instrument sets required to be stored. 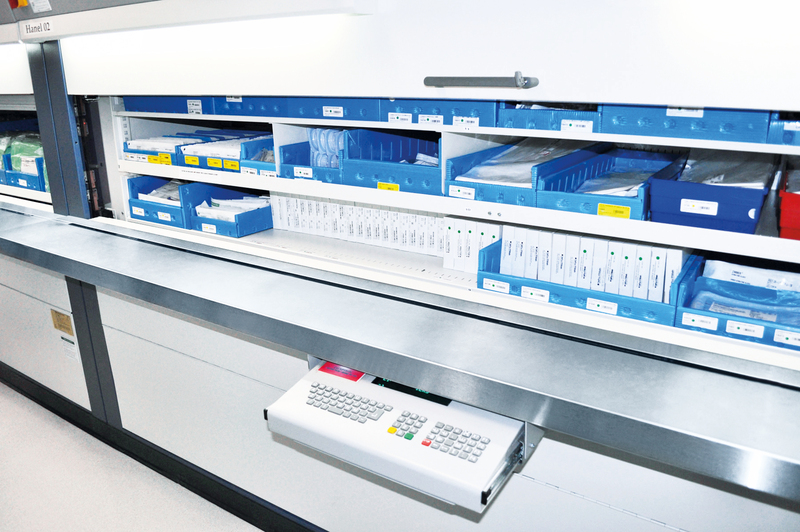 The Hänel Rotomat® system allows surgical instrument trays and other supplies to be ergonomically accessed from automated shelving designed similar to a Ferris wheel. The Rotomat® uses the full room height and stores the surgical trays in an extremely small footprint, saving as much as 80% of the current floor space consumed by wire or metal surgical instrument racks. This saves costs! 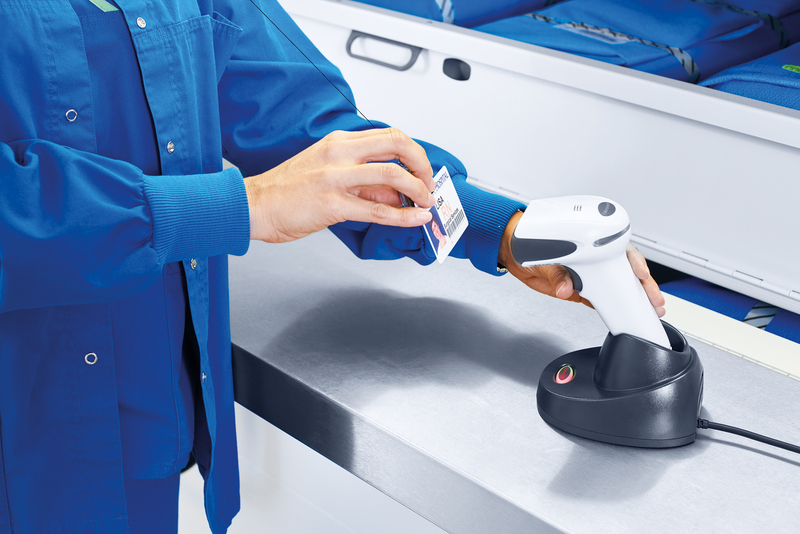 Integrated to existing instrument tracking systems, the Rotomat® delivers the requested inventory to an ergonomically correct location for the CS/SPD personnel to easily remove or restock heavy instrument trays. On-hand accuracy is typically over 99%. That saves time! Access points on several floors ensure fast and accurate retrieval. There is no walking or climbing of stairs involved. Hänel Storage Systems is proud to be a Professional Partner of IAHCSMM, helping to promote information-sharing and inter-professional education. Hänel recognizes the detail-focused role of CS/SPD professionals in the OR and other critical departments, and is dedicated to promoting the best in healthcare storage for top customer service and quality patient care.